As much as I love hearty, long cooking, winter dishes, they just don't work in the summer. Those type of dishes are too heavy and are too much for summer. So cooking needs to lighten up, but can still have good flavor with just a hint of those hearty dishes. I had picked up fresh zucchini and squash at the farmers market and wanted to do something with fish. The addition of cream to this helps give this dish that hearty, home cooked winter dish feel while still being light and summer-esque. One final note, I happened to have blue cheese filled olives and they really gave this dish a little fun zing! So, you can use which ever olives you have - but if you happened to be at the store looking to buy some, try the blue cheese option! They come in handy in a lot of ways. 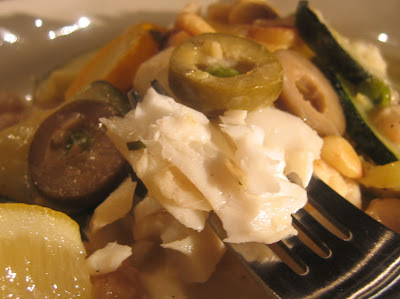 Try this fun light fish dish for a little heartier feel- you'll be fat and happy! Add 3 Tilapia filets and sautee for about two minutes. Add 1/2 cup cream, let simmer for another minute or two. 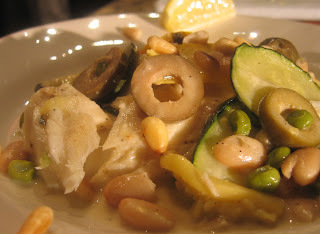 Top with toasted pine nuts and a little lemon to serve.